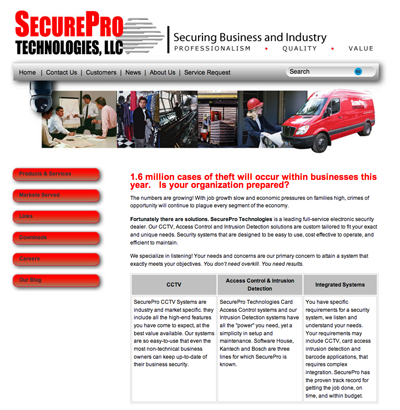 I asked Impression Engineers to create a new website for my company SecurePro Technologies. We are an electronic security integrator and needed to upgrade our existing site to a more professional one. I met with the team from Impression, explained what we needed, and some detail about how it would be used. They went to work on it and came up with a site that works extremely well for us, our employees and our customers. What we got was better than I imagined. First, the entire project was done on-time and on-budget. Secondly, we were trained properly on managing the online forms, etc. But lastly, the number of hits and unique visits to our website is up nearly 400% in just the last six-months since the site went live. We are consistently positioned on the first or second page of Google and other search engines, and under multiple search topics are Google’s #1 listing! All I can say is WOW. Great Job Impression Engineers! I would recommend them to anyone! Peter came to Impression Engineers with a vision that his site should be as delicate as his work. Peter is recognized as a master of Renaissance decorative finishes. His artistry, superlative craftsmanship, attention to detail, unique techniques and depth of technical and aesthetic understanding have enhanced and transformed an impressive list of private homes and commercial enterprises for the past 15 years. We developed Peter’s logo, website, printed marketing materals and Corporate ID package including his letterhead, from concept, to copywriting, to printed piece. Let’s develop your site as an integrated part of your marketing and business strategy? We develop entire online and offline marketing strategies from scratch or pick up where others have left off. Having an integrated marketing system is vital.We create well-coordinated Internet marketing strategies including shopping carts, autoresopnders, Pay Per Click ads, search engine optimization, e-zines, podcasting, and blog marketing to generate traffic, leads and most importantly SALES for you. If you need a logo, corporate ID system, media kits, printed postcards or brochures, we can help. We can even host your site on our secure server! Right now you could be well on your way to having a site that represents the real you. What will you do when you have all the new clients you want? What will you do when you are selling more product than you thought possible?